For people having trouble with their bodies cooperating with their desire to engage in regular, low-impact exercise like yoga, chair yoga may be a wise solution. 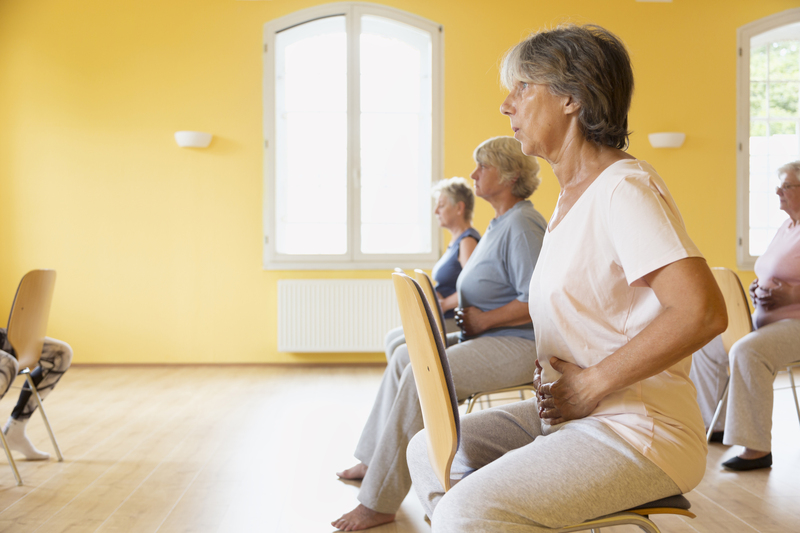 A gentle form of yoga, chair yoga is ideal for people unable to engage in traditional yoga classes due to the effects of aging or disabilities. For that reason, it was one of the first integrative health modalities to be launched at The Hacienda at the River, the latest senior residential community initiated by the Watermark Retirement group. “It’s a truly adaptable health therapy,” says Dr. Leah Stauber, University of Arizona College of Nursing faculty member, who teaches The Hacienda’s weekly chair yoga class. “You don’t need to be in any particular space, you don’t need any props or even an instructor once you’ve had some practice. Since many of the guests at The Hacienda rely on a cane or a wheelchair to be mobile, the beauty is it’s accessibility because it cane be performed anywhere, anyplace, anytime.” Among several benefits, evidence indicates positive effects on breathing, range of motion and mood/mental state. Dr. Stauber, with her more than 10 years of experience in teaching chair yoga, has also taught traditional yoga to high school students, social workers, expectant and new mothers, nurses, memory care patients and professional athletes. On a recent Thursday morning, six Hacienda residents gathered in a peaceful, inviting sunlit living room, surrounded by leather-bound books, plants and comfortable furniture. to participate in Dr. Stauber’s class. Following Dr. Stauber’s class, residents commented on appreciating the opportunity for exercise as well as the social pleasure of engaging with a group. With a focus on independent living, assisted living and memory care communities, The Hacienda residents are helped to advance their personal wellbeing in ways that are physical, spiritual and emotional. For example, aromatherapy, reflexology, acupressure and acupuncture have been woven into care, but the special value of chair yoga is that it is active and helps residents accustomed to a sedentary existence to become more mobile. Dr. Stauber points to the fact that The Hacienda’s caregivers also have attended her class to learn stretches and therapeutic movements they can then do one-on-one with their family or loved one.